A cruise vessel along- side and bunkering at the Port of New Orleans. port for some of their ships. In July, the port signed a new ? ve- Julia Street for trips to the eastern Caribbean as far back as year agreement with Carnival, keeping the world’s biggest 2013. Before that, the operator’s Navigator of the Seas was cruise line sailing at least two vessels from the city year-round docked there. New Orleans, based on single-count embarkations. And it Orleans. Rhode Island-based Blount Small Ship Adventures took 660,000 passengers, based on double-count embarka- has run cruises to the city on its Grand Caribe vessel. 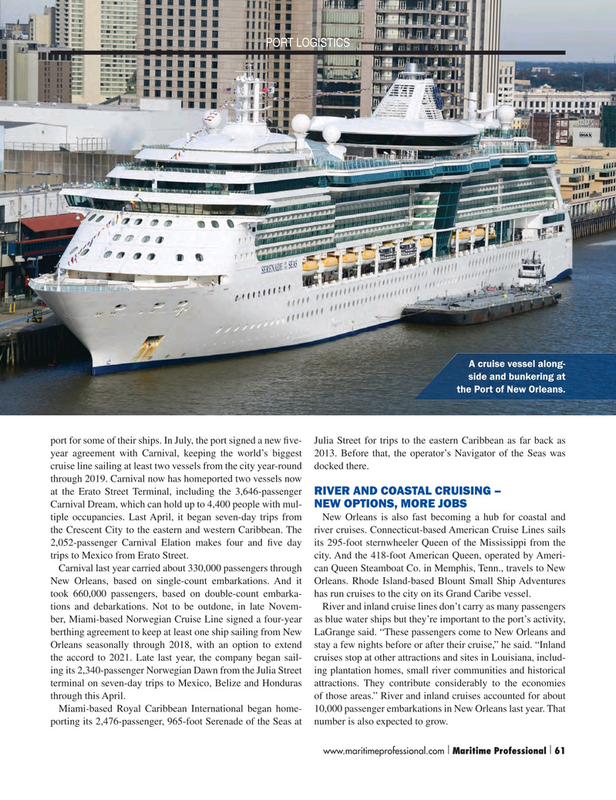 Miami-based Royal Caribbean International began home- 10,000 passenger embarkations in New Orleans last year. That porting its 2,476-passenger, 965-foot Serenade of the Seas at number is also expected to grow.